Actually, telling yourself to stop worrying doesn’t work. Sure, you can probably distract yourself and keep anxiety at bay, but your emotions always have a sneaky way of creeping right back in. 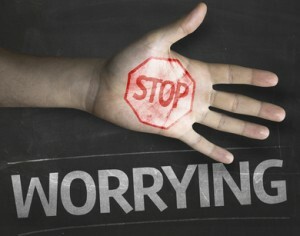 In fact, actively telling yourself to stop worrying often only makes things worse. If you tell yourself not to think of an elephant, you’ll only push yourself to think of an elephant—it’s a Catch 22. It’s simply how the mind works. However, this isn’t to say there’s no way to control your worries. What’s needed is another more strategic approach. Instead of getting rid of your anxiety, give yourself time to worry and not do it at any other time of the day. Postpone your anxious feelings for a time and place specifically chosen for worrying. Try to do it at the same time and place every day (say, 5 to 96p.m. in your bathroom). Give yourself permission to worry about everything and anything on your mind. But remember, only do so when you’re in this worry zone. If you have a thought bugging you during the day, worry about it later. That’s right, procrastinate. Save your anxious thoughts for later so they don’t interfere with your daily routine. Work now, worry later. All your mental notes to worry later might have result in a long list of things to worry about, so go ahead and write them down. This gives you a plan to reflect over your thoughts and realize that some of things you’re worrying about, don’t really deserve all your trouble. Learning to postpone worrying and anxiety is effective because it forces you to stop dwelling on your problems and live in the moment. This way, you can still function like a normal person.